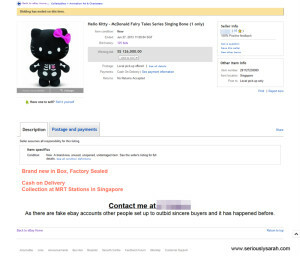 So if you haven’t known, from the various news reports and whatnot, McDonalds in Singapore had Hello Kitty Fairy Tale dolls if you purchase it with a value meal or something. The line up is as such, the witch from the Wizard of Oz, the Ugly Duckling, the lion from Wizard of Oz, the Singing Bone, the Frog Prince and Red Riding Hood. As for the witch, she was exclusive for deliveries only so you could get her if you called McD’s delivery. My friend in Norway commented that she didn’t really look like the witch from Oz but that she was more like a McDonald’s staff who was a witch? Very Kiki’s Delivery Service. For the rest, we know their stories pretty much. Except for the Singing Bone. This particular kitty caused a near riot at some McDonald’s branches, some have called that the government should step in just because they couldn’t get one. Others blamed the staff for not having more. I don’t know man, I thought the staff actually COOKED and sold food, not manufacture the cats. And some have bid for this kitty till $126,000. 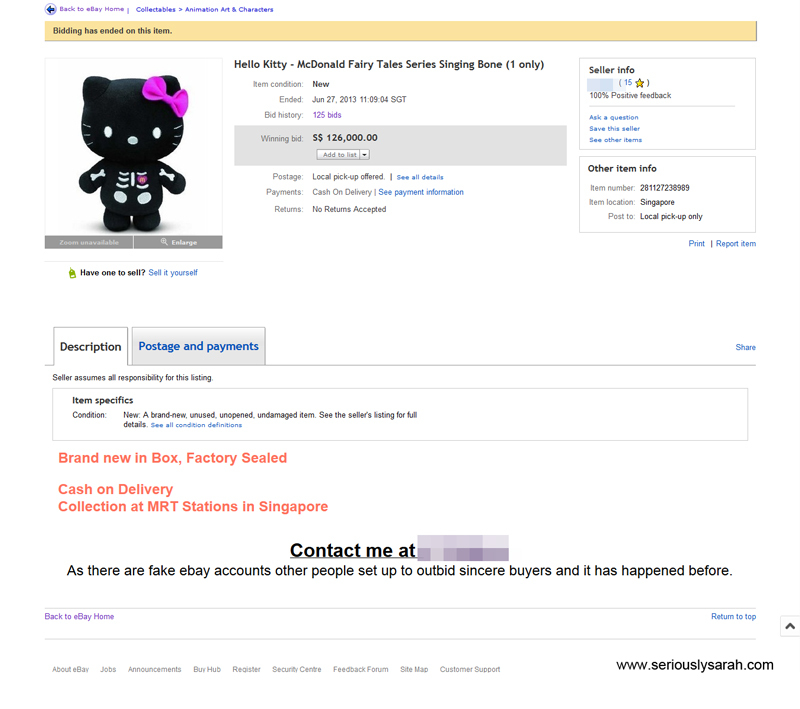 I don’t know if they are legit bidders but at least 28 accounts bid for it. If they are because if you don’t, your account gets banned and such which from what I see these are NEW accounts without reviews, they might just heck it. If it was real, the details said cash on delivery. I don’t know how you’re stuffing $126,000 in briefcases or bags and going to the nearest MRT station for a meet up. With all these ridiculous happenings, do these people know the story?